Somewhere in the order of 80% of the problems we experience on a daily basis can be traced back to the fact that our inventory records are not accurate. Solve this one problem and we can release valuable time for improvement projects. The inventory accuracy in a small batch environment is essential. Without accurate inventory a one piece job stops in its tracks for any inventory discrepancy. 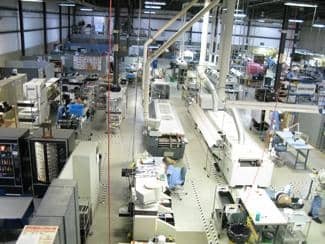 When manufacturing electronics, we don’t build thousands of the same circuit boards where losing one is just a small percent, one piece could be our whole order and the customer is counting on it to be fast, accurate, and on time. However, we do build hundreds of different assemblies and some will use common parts but most are unique to the assembly, so you must have a solid, accurate inventory count of all the different components. Purchasing and planning depend on our inventory accuracy to determine the quantities of parts needed for our demand. Buyers must be able to rely on the numbers that they see in the system; they cannot check every part as they create jobs and schedule material. The master scheduler plans jobs around the available inventory and last part received. This will create a work shortage for the production floor and most of all will result in a disappointed customer. Your stockroom must be secured, if you expect to keep an accurate inventory. Only personnel that are accountable should have keys to the stockroom. Treat your stockroom as a bank. When was the last time you gained access to the vault in your local bank? The raw material inventory can be one of the largest assests an electronics manufacturing company has. Treat it as such and make sure that it is safe and secure at all times. Be sure that your stockroom is clean and organized with a place for everthing and everything is in its place. This leads us to kitting, if quantities and locations of parts are not precise it would be unlikely for us to ship a one piece job quickly when planning ship date times around last parts received. There is no time to wait on parts that should have been here. Cycle Counting consistently each month has improved material accuracies in our fast paced workplace. For electronics manufacturing shops that do an annual Physical Inventory, many hours are put into this exercise only to find that within days the inventory will be off again. Monthly Cycle Counting of the “A” parts is essential, you can do “B” parts quarterly, and “C” parts semi-annually. Adding scrap factor to SMT, (Surface Mount Technology) Auto Insertion, and Wire helps inventory accuracy; it helps account for parts that are going to be lost. Counting SMT parts at tear down of the job is critical because it is a known fact you will lose parts during this the beginning and end of a job. Many of these parts are reeled and not expensive but it all adds up. One last thing that I want to remind you of is that when you have part shortages, this usually means a purchase order must be placed for an overnight shipment. The costs for a RED shipment are many times in excess of the material that you are buying. This expense will reduce your profits so keeping them to a minimum is a must. What type of issues have you seen when it comes to inventory accuracy? How does your company ensure inventory accuracy? Comment below or let us know on our Facebook page or Twitter! Elsie joined RBB in 2005 as a material specialist and is currently the Stockroom Manager and back up Master Scheduler. In her free time, Elsie enjoys cross stitching and reading.